Oh, how I love potatoes. Choice is good – that is, until I’m hungry. When the hunger pangs start kicking in, I need to make a decision quickly. There’s no time for contemplation. I need a menu with slim pickings so I can make a hasty decision before my thoughts are drowned out by my belly rumbling. That said, I learned the hard way that Ramsi’s Café on the World is not the place to go when you craving some quick food. It’s not the service that’s the problem. Nor is it slow cooks in the kitchen. There’s just too many choices. The name of this Bardstown Road restaurant is to be taken seriously. Ramsi and his crew have created a cozy eatery that takes your taste buds around the world in just a few bites. Nearly every palate will be satisfied with the restaurant’s extensive selection of international cuisine with an American edge. In the mood for Mexican food? They’ve got it. How about Middle Eastern? They’ve got that too. Italian? Cuban? Indian? Yes, yep, you betcha. Ramsi’s is the only time I’ve ever eaten Brie Bernadette ($7.99) and Ribs of the Caribbean ($11.49 half, $16.79 full) at the same sitting. Though I’ve visited Ramsi’s a few times, I always forget the pickle into which I always seem to fall. I’m usually starving by the time I get to the table, but go into a deep panic when confronted with all of the menu options and feel I need to thoroughly mull over every dish before I make a decision. With more than 50 dishes on the first page of the two-page menu, I have to take some time to consider all the wonderful options. The prices make the decision-making even worse. The majority of Ramsi’s sandwiches, such as a turkey burger with Jarlsberg Swiss or the Greek Chicken Fajita Pita, are less than $10 and come with a side such as fried plaintains or potato latkes. Most of the entrees, including the eclectic East Meets South Fajitas and the BBQ Tempura Salmon Brochette, hover between $9 and $18, but previous experiences have shown me that the entrees are big enough to split between two people. After my two dining companions and I sent the waitress away twice, I finally settled on the panini caprese ($8.40), a sandwich with oven-roasted tomatoes, goat cheese, grilled chicken and basil aioli. The hot sandwich comes with roasted potatoes, but the waitress said it would be no problem when I asked for the fried potatoes instead. 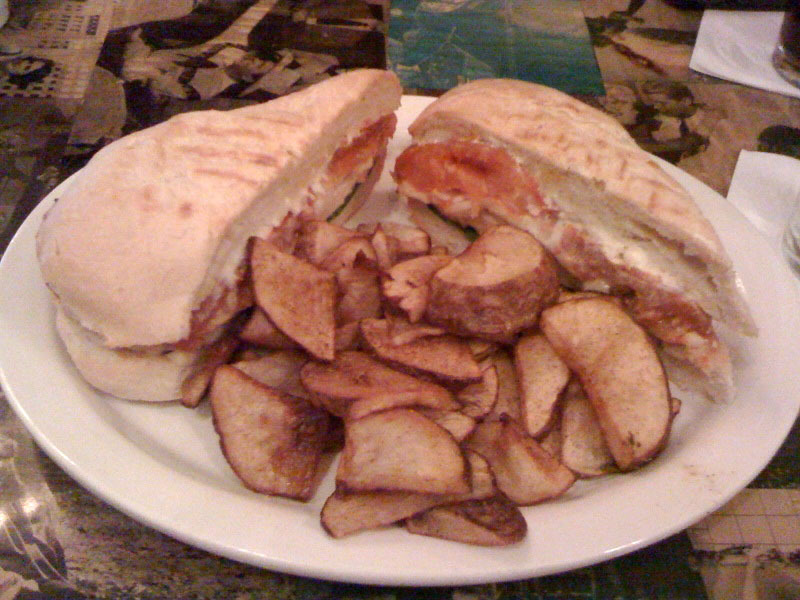 Ramsi's panini caprese with fried potatoes. At first, I thought my Hungry Monster was blowing my taste buds out of whack. The sandwich couldn’t be as good as I was thinking it was. But after a few more bites, I realized that this was the best panini I had eaten in recent memory. The hearty bread provided a strong foundation for this monster of a sandwich that was packed with tender grilled chicken and tangy goat cheese. The oven-roasted tomatoes were juicy and had a wonderful flavor on their own. And the basil aioli that topped it all off brought the dish together to make one heckuva take on Italian. 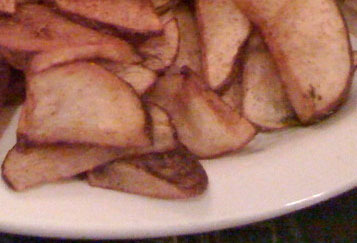 The fried potato wedges, though not a traditional sidekick to an Italian dish, were also delicious and had a perfect slightly crunchy exterior. 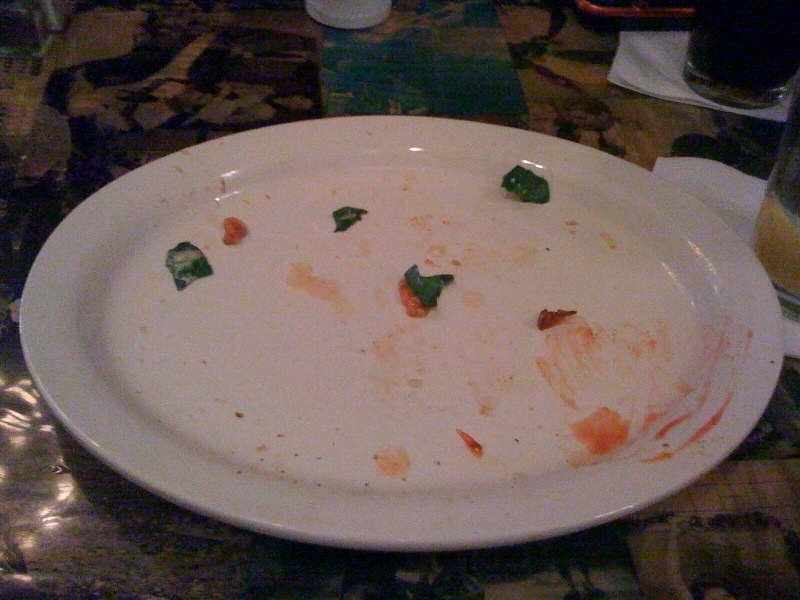 Yep, I ate it all. Not very ladylike, I know. Ramsi’s is worth making many return trips because of its selection and prices. But next time, I’ll either study the menu and make a selection before I go or pick a time when I’m not extremely hungry so I can take time making my selection without hearing my stomach growl. The restaurant now offers a Sunday brunch. Though it doesn’t meet a $10 Challenge budget (it’s about $15), it is worth saving up some extra money and making at least one trip. Find out more about it here. Go through the patio area to get into the restaurant. Their brunch is AMAZING! I try to visit my Louisville friends that live down the street on a Sunday so we can start the day with their brunch. So many options, and I’m a sucker for a fried plantain 🙂 This reminds me, I have a Groupon I need to use for them… looks like a trip will be in my future. I appreicate your description of “choice overload”… so true at Ramsi’s. One idea for the $10 challenge… La Colombiana in Lyndon. YAY $10 Challenge! I feel kinda famous seeing as I was there w/ you. We should make it our pledge that everytime we go there (w/ the exception of brunch of course) that we must get something different. There are simply too many choices to eat the same thing twice. What an eclectic menu! You make a strong case for visiting, and we love to hear that Jarlsberg is featured on the turkey burger. Thanks for mentioning it.